, in Greek mythology, sea god, son of Pontus and Gaea. He married his sister Ceto, who bore him a brood of monsters, including the Gorgons, the Graeae, Scylla, and the Sirens. , in Greek mythology, river god; son of Oceanus and Tethys. He possessed the power to appear as a bull, a serpent, or a bullheaded man. Hercules defeated him and broke off one of his horns, which, according to one legend, became the cornucopia. ..... Click the link for more information. , the Sirens inhabited an island surrounded by dangerous rocks. They sang so enchantingly that all who heard were drawn near and shipwrecked. Jason and the Argonauts were saved from them by the music of Orpheus, whose songs were lovelier. Odysseus escaped them by having himself tied securely to a mast and by stopping the ears of his men. in ancient Greek mythology, a half-bird, half-woman. According to Homer’s Odyssey, the sirens used their enchanting voices to lure sailors to rocky shores, against which the sailors’ ships were smashed. In order to save his ship, Odysseus stopped his companions’ ears with wax and ordered himself tied to the mast. Similarly, Orpheus’ persuasive voice overcame the allure of the sirens and saved the Argonauts from death. The ancient Greeks also believed that the sirens were associated with an underground kingdom, and as a result, the sirens were often depicted on gravestones. The most common type of sirens in ancient Greek art were creatures with the head and chest of a woman and the body of a bird. Figuratively, the term “siren” refers to a beautiful and seductive woman with an enchanting voice. an acoustic radiator whose operation is based on the periodic interruption of a stream of gas or liquid. Liquid sirens do not differ in principle from gas sirens, but they are used comparatively rarely because of the difficulty in designing a mechanism for radiation into a medium with a high acoustic resistance. Sirens are classified according to the principle of operation as dynamic (rotating) and pulsating. Dynamic sirens are the most widely used type and are subdivided into axial and radial sirens (Figure 1). 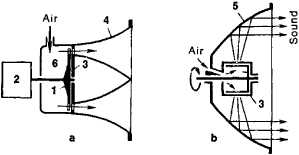 In an axial siren the air stream coincides with the axis of rotation; in a radial siren the air stream is directed along a radius perpendicular to the axis. In axial sirens a perforated disk—the rotor—rotates relative to a stationary disk—the stator. In radial sirens the rotor and the stator are two coaxial, usually cylindrical, surfaces. The rotor is rotated by an electric motor or by a small gas turbine. Air from a chamber enters under pressure through the apertures in the rotor and stator and is periodically interrupted. The frequency of air pulsations f is determined by the number of apertures in the rotor or stator m and by the number of rotor revolutions per minute N:f= mN/60 hertz (Hz). The frequency f is the fundamental frequency in the sound spectrum being radiated by the siren. The frequency range of sirens used in actual practice ranges from 200-300 Hz to 80-100 kilohertz (kHz); however, some sirens operate at frequencies up to 600 kHz. The power rating of a siren may be as high as tens of kilowatts. Dynamic air sirens are used for signaling, as in alarm and signal sirens, and for various technological purposes, including the coagulation of finely dispersed aerosols, defoaming, the precipitation of fogs, and the acceleration of heat-exchange and mass-exchange processes. Veller, V. A., and B. I. Stepanov. “Ul’trazvukovye sireny s privodom ot elektrodvigatelia.” Akusticheskii zhurnal, 1963, vol. 9, no. 3. An apparatus for generating sound by the mechanical interruption of the flow of fluid (usually air) by a perforated disk or cylinder. The warning sirens are used to alert the public to emergencies. In addition to the sirens, Hawaii has put out a series of public service announcements about emergency preparedness. Embarrassing,' was how Senate President Pro Tempore Franklin Drilon described on Wednesday the use of sirens in provincial airports to drive away animals from the runways. The new sirens have technical standards which are abreast with modern technology connected with digital communication system (TETRA). The sirens also could be used by local government officials to inform residents of a non-nuclear emergency, the company said and added that it will retire San Onofre Units 2 and 3 and begin the process to decommission the facility, as announced earlier in June. A 10-minute break will then be followed by several 70-second sirens to declare a state of danger, which would also last for 10 minutes. Insiders say that the model will be the face of Siren Shoes for the next three years as part of the yet to be announced deal. The enduring popularity of the Siren episode in Homer's Odyssey bears witness to the timelessness of the Greek classic in general and to the bewitching charm of this adventure in particular. Once the technology is demonstrated, I am confident fire and rescue and other emergency services worldwide will want to adopt this innovative siren system. A man from Hadera, who said he heard the siren just fine during the Second Lebanon War, said that he and his family waited and waited for the drill to begin Tuesday - to no avail. The female archetype and its powers are explored in this survey of Siren images, which serve as a metaphor for psychological challenge.